There are many benefits to joining a team. A team can be a great launching pad for new racers wanting to learn the ropes and start developing a professional network for future opportunities. Learning how to be a solid team player despite varying team dynamics is a valuable quality you can pick up by riding with a team. 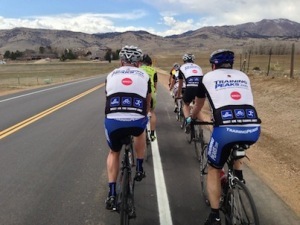 Riders who demonstrate a great sense of teamwork are like gold to teams at every level. Plus, being a part of a team is a great way to keep a group of people around you that share many of the same goals and values you may have. With that said, here are a few questions that may be worth answering before going on your team search. We already touched on some of the positives of joining a team above, but if I had to pick the most important one I’d say it’s mentorship. In general, mentorship is a great avenue to take anytime you are trying to develop and perfect a new skill. Teams are great places to find experienced racers that can mentor you and help you get to where you want to go. Most experienced racers I know are more than happy to assist new riders coming up through the ranks and help them achieve their goals. They can caution you about any mistakes they may have made and what you can do to avoid those mistakes, along with plenty of tips on what they may have done that resulted in success. Many mentors can help you not only improve as a racer, but also professionally. I’m not only referring to pulling in that pro contract, but how to present yourself as a professional in all your interactions on and off the bike. If you ever have any aspirations of making it as a professional, your best bet is to act like a professional long before ever signing a pro contract — and a good mentor can show you how to do this. When looking for a team, you can always search for a club to join through USA Cycling’s club searching tool. However, the best way to find a club that fits your personality and your goals as an athlete is to invest the time in being active in the racing scene. Go to races, strike up conversation with riders from various teams, and just get to know the people in your local racing scene from racers to officials. Taking the time to get to know the local scene will really help you get an idea of what teams share the same ideals and goals that you have, as well as network with people who can vouch for you down the road. When you’ve decided on a team, find a good contact to reach out to on the team. If you have someone on a team that can put in a good word for you, make sure you use that connection. Also make sure that you send a personal email with your resume to the team director. If you’re a good match for the team, you should hear back. If not, don’t take it personally — a team may have limited resources or simply be going in a different direction from where you want to go. You’re always better off on a team that has goals that mesh with yours, so being turned down by a team that has a different long-term view than yours can really save you a lot of frustration down the road. Keep in mind that it’s also always a good idea to remain polite, humble, and cordial in all your interactions with any team. The racing scene is too small to be burning bridges along the way as it will catch up with you at some point. Many team directors ask other team directors and members about a rider before they agree to take him or her on, and you want to make sure that you haven’t given anyone any reason to say something negative about you. Burning too many bridges may make it hard to find any team to be a part of before long. There are some key things you want to try to identify from a team you would like to be a part of. One of the biggest ones is making sure that the team’s goals fall in line with your goals. For example, if your goal is simply to have fun, then you should look for a team that values that and makes that one of their priorities in the team atmosphere. Some of the most frustrating situations within a team can be avoided by making sure you and your team are on the same page. You also want to belong to a team that you can contribute to. Teams often rely on the contributions of the riders to keep the team going or even grow the team from year to year. One big thing that teams rely on their riders for is exposure, as exposure generates more sponsorship dollars. This basically gives you a marketing job for that team if you sign with them. When a team gets more sponsorship dollars, the team can support a more extensive racing calendar for riders, provide more equipment support for the riders, put more into races they organize, etc. In short, the team’s success breeds success for you as well, so join a team thinking about how it will help you reach your goals, but also what you can do for the team in return. What Can I Expect From a Team? No matter your goals, there is one thing you should always expect from any team — and it falls in the category of intangibles. You should expect to have guidance from other team members. That being said, team dynamics do vary and sometimes you will only get the help you ask for. So, don’t be afraid to ask your teammates for help or guidance. When you start getting into monetary or equipment support, your responsibility as a rider will generally increase with the increase in resources put into you. If you don’t want a lot of responsibility to perform well on and off the bike, don’t plan on going to a team with a long list of material demands. Some teams that put a lot on the line to support their riders may require a contract to guarantee a commitment from their riders. It is important to read through the contract thoroughly, because once you sign it, you should in good faith withhold your end of that contract for the same reasons discussed earlier in terms of building relationships and not burning bridges. Sometimes unforeseeable circumstances may arise where a team can no longer uphold their end of the contract and they may release you to allow you to pursue your goals elsewhere. While this may be disappointing, conducting yourself professionally in this scenario always breeds the best results and may even open a few new doors for you through positive word of mouth. What Might My Team Expect From Me? This is one of the first questions you should always ask a team you are interested in as it clears the air as to what the team’s goals are and how you fit in to achieving those goals. This way you walk into the team knowing exactly where you fit in the big picture. If your team’s expectations of you mesh with the goals you set for yourself, you know you will be in a good environment that will help push you to grow as an athlete. Once you’ve decided on a team, your team should expect you to make good on any commitment you made whether it be written or verbal, providing they uphold their end of the agreement too. If your team has laid out a race schedule, it’s always important to be at mandatory races and communicate well in advance if you can’t do so. Exposure is the lifeblood of a team, so if a team is not getting that out of their riders, it can very well die off. Finding a team can be time consuming, but it’s worth taking the time to find the right fit. Invest the same time into finding a team as you would a new job. You’ll be working with these individuals through thick and thin for a whole season, and if you find the right group you’ll gain something even more valuable — lifelong friends and connections. Jason Short is a coach for Threshold Endurance Sports and has been racing on the road since he was 18. During his career, he has spent time racing in Europe for various European teams as well as some stints in Belgium with the U.S. National Team. Jason holds a B.S. in Sports and Fitness Management, a USAC level 2 coaching certification, and in addition to cycling has a background in corporate health coaching. Learn more about Jason and his coaching at www.thresholdendurance.com.